Swap spreads have marched to a firmly negative value in the United States, which is historically unusual. The fact that the previous time that swap spreads were negative was during the financial crisis makes this event more interesting. Although there is no doubt that seeing signs of an imminent financial crisis makes for more exciting copy, I am not too convinced that this development is not that big a deal. Although this probably reflects some market stresses, it also tells us that regulatory reforms are actually working. This article gives what I hope is a basic introduction to this topic. Negative swap spreads are one of the market dislocations discussed in the article "Six very strange things have been happening in financial markets around the world," by Tracy Alloway. As noted by an analyst in the article, this is related to regulatory reforms. “The people who can arbitrage it away, their costs just went up a whole lot,” Amrut Nashikkar, a Barclays analyst, said in an interview. “We wouldn’t expect a dramatic reversal in the moves,” he added. the other side pays a floating interest rate (LIBOR), which is typically a 3-month rate that rolls every 3 months. For those who are unfamiliar with swaps, I think it is easier to think of them as a means of transforming a fixed income instrument into another instrument. I will thus explain how swaps are used. the 10-year (fitted) Treasury rate was 2.27%. Let's pretend that we can buy a 10-year Treasury bond at 2.27%. (In the real world, we have to buy a benchmark Treasury Note that is close to a 10-year maturity,and normally trades expensive to the fitted curve.) The 10-year swap spread is the swap rate less the Treasury rate, or -13 basis points (-0.13%). Imagine that we are working for a rather boring investment fund that wants to have a nice safe $10 million investment in 3-month Treasury Bills, as we do not like credit risk, and we are waiting for the Fed to hike rates. We expect that we will be sitting in this position for a number of years, rolling the 3-month bill. pay fixed in a $10 million 10-year swap at 2.14% (receiving LIBOR). If we assume that the cash flow dates are properly aligned, we see that the fixed interest rate payments on the Treasury and the "fixed leg" of the swap almost cancel out; the fund would receive a net +0.13% fixed, plus LIBOR. This is typically written as "LIBOR+13" (basis points). The chart above shows why this is a good structure. It shows what is commonly referred to as the 3-month TED spread -- the Treasury/eurodollar spread. 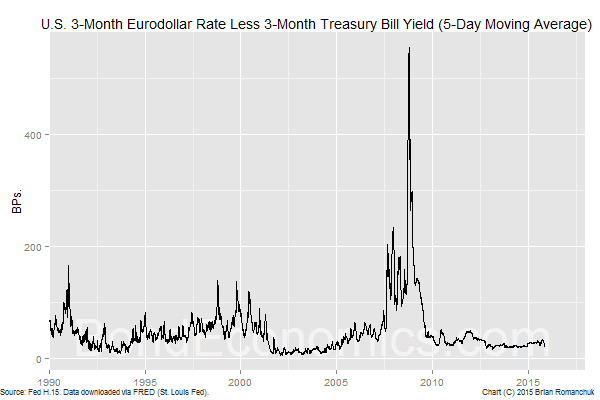 (A eurodollar is a USD deposit in a bank in London, and thus is a form of "free market interest rate," as those deposits are not directly regulated by the Fed.) This spread is a pretty good approximation of the 3-month LIBOR/Treasury bill spread (the two rates on the Fed H.15 probably use different quote conventions). Other than a couple of outliers (possibly the result of the rate measurement times not being synchronised), this spread is generally a positive number. This is as commonly assumed -- the Treasury can borrow at a lower rate than banks in USD. Since the structure pays the LIBOR+13, the yield pickup versus just buying a Treasury bill is 13 basis points, plus the spread above. Equity investors might sniff at such a small yield enhancement, but a typical return target for a "real money" fund (that is, a fund that does not use leverage) is 20 basis points over the index. The only downside of the position is that you do not have 3-month paper; you have a pair of 10-year instruments. The swap and the 10-year bond have almost exactly the opposite interest rate sensitivity ("DV01") and so there is almost no market value changes due to parallel shifts of the 10-year bond and swap rates. There is a mark-to-market movement on the swap spread, but you only lose money if the swap spread goes more negative. Since it will presumably eventually revert to a positive value (see below) as the position rolls towards maturity, this is not a worry if you have the capacity to sit on the position. You will have some transaction costs to unwind the position, but those would be easily paid for by the positive yield enhancement ("carry") over just one year. The net result is that the funding cost is roughly equal to the negative of the TED spread shown above. In other words, your funding cost is -13 basis points, minus the (normally positive) TED spread. That is, you expect to generate a nice fat positive carry on a position for which you put (almost) no money down. You can get a nice juicy return on equity, which makes fixed income hedge funds viable. 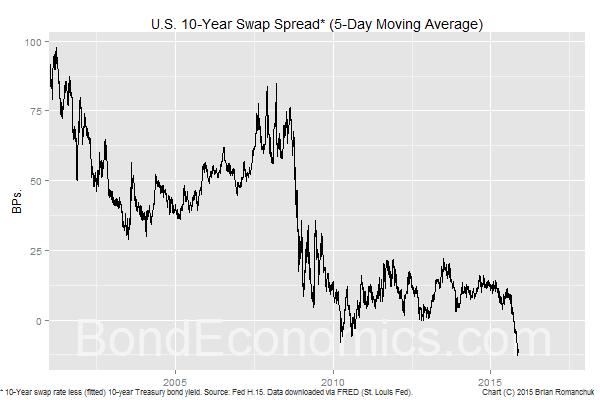 Looking at the above analysis, the 10-year swap spread should be equal to the expected average of the spread of 3-month LIBOR over 3-month Treasury bills over the next 10-years. Since we expect the TED spread to be positive, the swap spread "should" be positive. What has happened is that "rate expectations" are breaking down. What has happened is that the new regulations has meant that it is difficult for fixed income arbitrageurs to get the financing for the leveraged structures described above. There is a tendency for the swap rate to get pushed down, and the people who would have pushed it back up lack the capacity to do so. This cannot go on forever, as the people who do the "boring" non-leveraged trades will step up to prevent the spread getting too stupidly negative. There are two groups whose actions tend to push down swap rates. One group that pushes down swap rates are liability managers at funds; they want to neutralise their interest rate exposure without doing something foolish like buying bonds. Instead, they receive fixed on swaps, and keep their asset allocation tilted towards risk assets (equities, squirrel futures, or whatever assets their consultants tell them will allow them to hit their return targets). The other group that pushes down swap rates are bond issuers that swap their bonds for floating rate; they receive fixed in a swap to cancel out the fixed coupon on the bond that they issue so that it turns into a synthetic floating rate security. They do this because there is a larger demand for fixed rate bonds issued by the private sector than there is a desire to borrow at fixed rates. It must be kept in mind that nobody borrows at the swap rate; it is just a benchmark for which the borrowing cost of everyone is measured relative to. Therefore, there is no natural "supply and demand" factor that will push swap rates higher as a result of people taking advantage of cheap borrowing costs (other than the fact that receiving fixed in swap looks increasingly unattractive versus alternatives). In summary, the negative swap spreads are the result of regulations limiting the ability of arbitrageurs to return swap spreads towards a notional "fair value" from where flow imbalances are taking them. There is constant drumbeat of analysis from investment banks highlighting these unusual market pricing events, blaming them on regulations, and hinting that bad things will happen if this continues. Actually, this is a sign that the regulations are working. The whole point of regulatory changes was to reduce foolish risk-taking within the financial system. As a result, we should expect greater relative value disturbances within the markets. However, they cannot go on forever; eventually investors with big balance sheets will step in if things get too far out of line. Dislocations in the fixed income markets only matter if credit-worthy borrowers cannot get access to credit any price. There are a number of highly levered firms, and firms in the commodity industries, that are having difficulties. The financial system does have a tendency to freeze up as defaults cascade through the chains of highly levered firms that financial engineers tend to create. However, it is unclear to me whether the disruptions that we have seen so far are a healthy re-pricing of risk or a sign of developing problems. In any event, the swaps market is a pricing market, and not a funding market, and dislocations there do not imply anything about the availability of credit. Negative swap spreads provide a wonderful relative value opportunity (at least for those who did not already have the position in place), but is not enough to conclude that the financial system is under stress that will lead to a credit crunch.